Morrissey will kick off his rescheduled U.S. tour next week with a live performance on “The Late Show with David Letterman,” stopping by the talk show on Tuesday, according to CBS, before opening the two-month, coast-to-coast trek the following night in Long Island, New York. The tour, which runs through mid-March, was rescheduled after Morrissey postponed dozens of dates last fall to return to England to be with his ailing mother. Moz resumed touring last month in Australia and New Zealand. 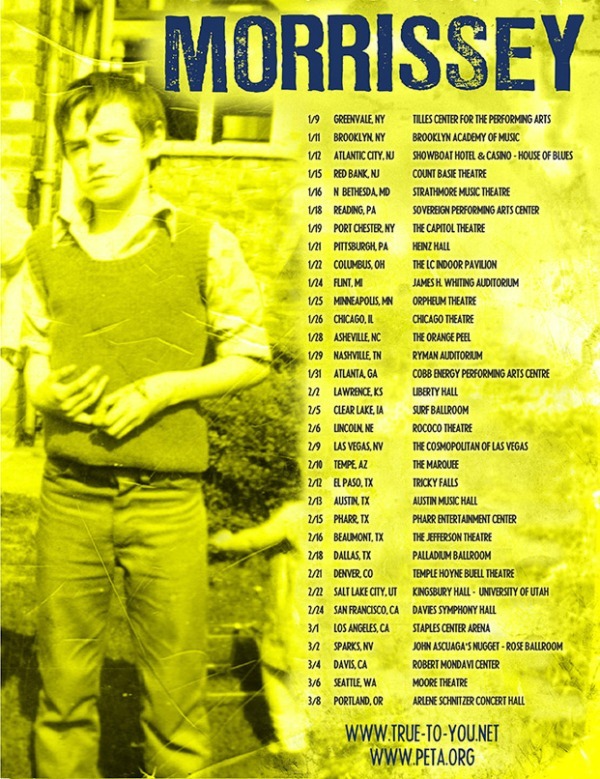 Morrissey reschedules U.S. tour, adds 8 dates, replaces Stooges with Patti Smith in L.A. I guess TX has a big music scene. New Order stopped there, but that was as far south (within the US) as they went. Except for the Miami music fest, but I’m too old for that crowd. 5 dates in Texas and not one in Canada? What gives?